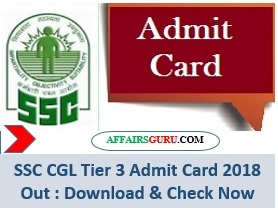 Staff Selection Commission (SSC) has finally started to release the SSC CGL (Combined Graduate Level) Tier-III Descriptive Paper schedule. Exam will be conducted on 8th July 2018. Admit cards for all the regions will be available soon on the official website of SSC. Below are the some link to the particular region, candidates can check own exam schedule (Date, Time & City) of SSC CGL Tier-3 2018 by clicking on the respective link. Candidates can check the schedule of SSC CGL Tier-3 Exam for the KKR which is going to happen on 8th of July 2018. Candidates can check the schedule of SSC CGL Tier-3 Exam for the North Region (NR) – Rajasthan, Delhi, Uttarakhand which is going to happen on 8th of July 2018. Candidates can check the schedule of SSC CGL Tier-3 Exam for the Western Region (WR) – Maharashtra, Gujarat, Goa which is going to happen on 8th of July 2018. Candidates can check the schedule of SSC CGL Tier-3 Exam for the MP Sub-Region – Madhya Pradesh, Chhattisgarh which is going to happen on 8th of July 2018. Candidates can check the schedule of SSC CGL Tier-3 Exam for the Eastern Region (ER) – West Bengal, Odisha, Jharkhand, A & N Island, Sikkim which is going to happen on 8th of July 2018. Candidates can check the schedule of SSC CGL Tier-3 Exam for the North Eastern Region (NER) – Assam, Arunachal Pradesh, Manipur, Meghalaya, Tripura, Nagaland, Mizoram which is going to happen on 8th of July 2018. Candidates can check the schedule of SSC CGL Tier-3 Exam for the Southern Region (SR) – Andhra Pradesh, Pondicherry, Tamilnadu which is going to happen on 8th of July 2018. Candidates can check the schedule of SSC CGL Tier-3 Exam for the North Western Region (NWR) – Haryana, Punjab, J & K, Himachal Pradesh which is going to happen on 8th of July 2018. Candidates can check the schedule of SSC CGL Tier-3 Exam for the Central Region (ER) – Uttar Pradesh & Bihar which is going to happen on 8th of July 2018.